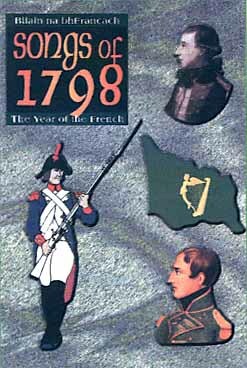 Songs of 1798 published by Cló Saoirse, was launched at Fleadh Cheoil na hEireann, in Ballina, Co. Mayo, August 1997. This is a new edition of a collection first published in 1982 and it has the sub title ‘Bliain na bhFrancach’. Since it is linked to the landing of General Humbert’s expedition in Killala it has a distinctly West of Ireland orientation. The contents are present in their historical context, with plenty of notes and explanations, illustrations and documents of the period, Republican Proclamations and Dublin Castle Bulletins. Wexford, Antrim and Down are also well represented, with such songs as The Croppy Boy, Boolavogue, Henry Joy and General Munroe. The recitations include The Man from God Knows Where, Páid O’Donoghue, An Croipí Bocht and An Gunnadóir Mac Aoidh. The music is included for some of the songs. The first Irish patriotic ballads in English, as we know them, date from the second half of the eighteenth century, but many of the 1798 ballads were written for the centenary in 1898. This particular collection is not exhaustive, but it is complete enough to give a representative selection, in both Irish and English. The 74 pages are packed with supporting explanatory material, including a diary and map of Humbert’s campaign in Ireland. The cover, presentation and layout are first class. It is a pity that the editor, Sean 0’Bradaigh, did not expand it by another 16 or 20 pages and give us, among others, The Wind that Shakes the Barley and Billy Bryne of Ballymanus. This collection, gathered in English, Irish and French from written sources and Irish folklore, will become an invaluable addition to the literature of the Bicentenary of 1978, which is almost upon us.